A few years ago, I posted a recipe from Oh She Glows for Easter Macaroon Thumbprints on the blog, which is still my favorite gluten free cookie recipe. Unfortunately, the Hubby isn’t a fan of coconut so I decided to try a different type of thumbprint this Easter. Baking has always been a challenge for me, especially gluten free baking. It is hard to find a gluten free recipe that I can successfully pull off and that the Hubby will eat. Don’t get me wrong, he is SUPER supportive of my dietary restrictions, but he isn’t a big fan of gluten free baked goods. However, over the last year I have come across several local gluten free treasures and resources for recipes. My favorite gluten free flour to bake with is almond flour mostly because I love almonds. Most of the gluten free recipes that I Pin call for almond flour, which comes in handy since I splurged and purchased a five pound bag of it. I came across this recipe on The Roasted Root and made a few tweeks based on our tastebuds. The Hubby is much happier with these thumbprints over the coconut ones. Personally, I will make them both in the future! 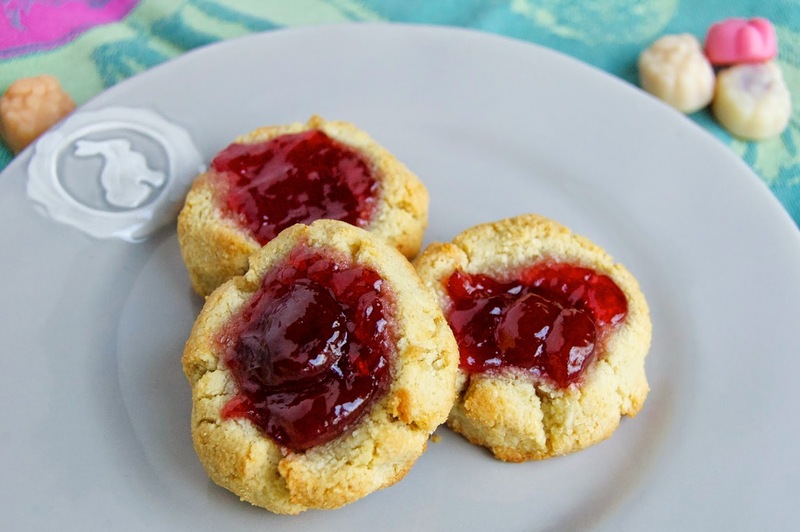 They are easy cookies to put together and pretty difficult to mess up, not to mention versatile based on which preserves you have in your fridge or decide to make during the season. We hope everyone has a nice Easter! Add the dry ingredients to a bowl and stir to combine. In a separate small bowl, add the wet ingredients and whisk until just combined. Stir into the dry ingredients until a dough forms. Using a tablespoon, roll a small ball of cookie dough in your palms, and gently press the center with your thumb. Repeat this until all the dough is gone placing thumbprints on a cookie sheet. 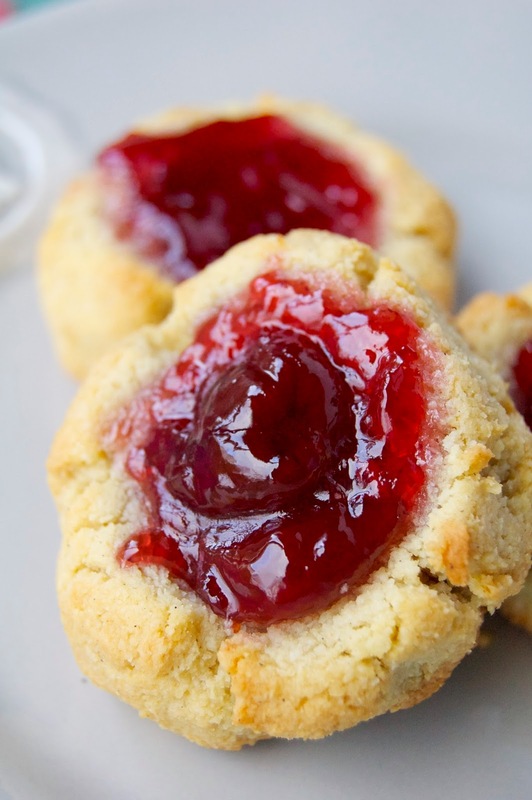 Spoon in a small amount of preserves into each well of the cookie. 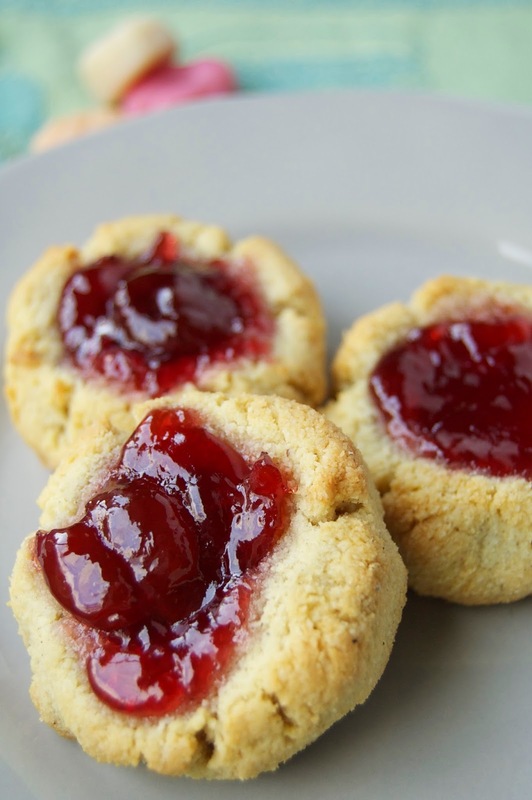 Be careful not to put too much preserves in each cookie so it doesn't overflow when cooking! Bake for 10-12 minutes until golden brown around the edges. Cool on a cooling rack and keep in an air-tight container for up to a week.